At Carolina Classic Boats and Cars we have a proven track record assisting buyers and sellers of antique, classic and unique boats and cars. We offer full brokerage services that let the seller have the flexibility to have your boat or car on site with us or list the item with us and keep it at your location. We can also act as a central agent or the client may prefer an "open" listing that still allows you the option to sell your boat or vehicle. Either way, our success rate speaks for itself. We will be happy to provide you with extensive references should you need them. Carolina Classic Boats and Cars is proud to have an enthusiastic customer base located around the world who are passionate about our products and service. We have sold a variety of antique, classic and unusual boats and cars to a distinguished array of collectors from most every continent. 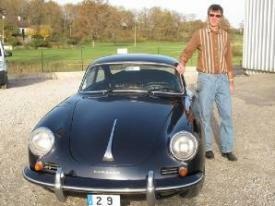 Here are just a few of our favorite customers and what they have to say about our unique sales and services..
"Greg was a pleasure to work with and was spot on in his description of my Porsche 356. I will not hesitate to work with him again." "Hi Greg, Now that our boat is restored, I'd like to take a moment and thank you for making my dream become a reality. Your honesty, knowledge and professionalism made our acquisition a truly pleasurable experience. In a competitive world where many place their own interests first, I was pleased that you very much care about your customers and do everything possible to make the search, and buying process, a memorable one. From the very first time I spoke to you, I knew that I could place my inexperience, and trust, in your hands-and I was not disappointed. I not only bought a beautiful boat, but am honored to have your friendship. Please rest assured that I would not hesitate to recommend your services to anyone who is even contemplating buying a classic boat. Thank you again from all of us!" "Greg, a belated "Thank you" for the gracious treatment you afforded Eric and I on our visit to look for a boat! We not only found "the" boat we were looking for, but two or three others would have filled the bill. 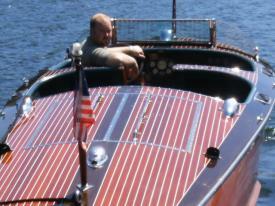 We love our "new" 1955 Chris Craft Capri and also the experience buying it. You were completely candid and honest with us and gave us information we probably would have neglected to ask!! You run a really fine operation and maybe we'll talk one of these days about a classic car! Thanks again!!" "Greg,THANK YOU for a wonderful buying experience. The 1956 Chris Craft Holiday was everything you said it would be. 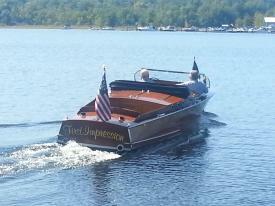 I truly appreciate your direct and honest evaluation on the condition of the boat. There were no suprises when I picked it up. I also appreciated your patience and prompt responses to my never ending questions-before, during and after the sale. 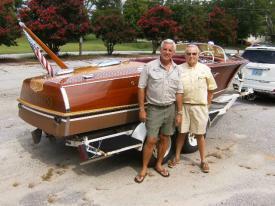 Carolina Classic Boats and Cars is indeed "the real deal"!!! "Thank you Greg for all your help. 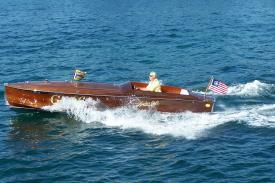 As you know,it was tough to part with my Dad's boat, but your expertise and friendly demeanor made it much easier. You'll definitely be my first call if I ever need to buy or sell a boat in the future. I look forward to staying in touch regardless. Best wishes." 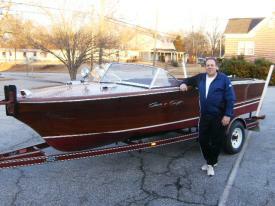 "Hi Greg, It was very nice to buy a boat from Carolina Classic Boats and Cars. Everything that you announced about the boat was exactly so. When the boat arrived in Finland my dream came true. 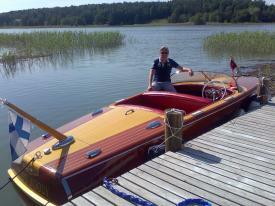 My Chris Craft Capri came perfectly transported and in brilliant condition." 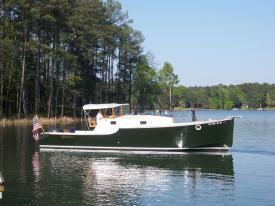 "Greg, thank you for all your efforts in securing a buyer for our beloved boat in this difficult market. It has been a pleasure to work with a professional who is fair realistic, prompt, and flexible. 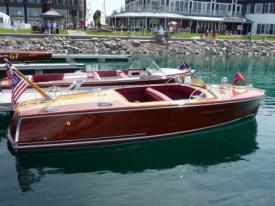 I will continue to pursue my boating passion, and will no doubt need your services again as a buyer as well as seller." This big "Thank you" is long over due because we have been having so much fun with our "new" HackerCraft Gentleman's Racer. We were very worried of driving all the way down to South Carolina from Michigan to purchase a wooden boat from an on-line source. But once we had worked with you over the phone for a month ,and your helping make the deal work, I felt it was worth the long trip. 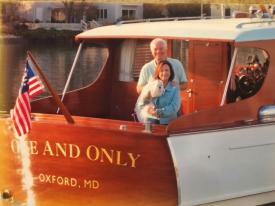 Once we arrived you made us feel right at home, and the sea trial and closing the deal was a breeze. We will be making another trip someday to buy another boat and or car from you because you are a straight shooter and a man of your word. We have since met alot of classic boaters over the summer and I always smile when I hear you name come up in a conversation. Keep up the great work for our hobby. My experience with Greg Jackson as my broker on "First Impression" was very rewarding and handled in a very polite and professional way. Having four different woodies over the last 32 years I have used others to sell my boats but I must say that not one of the other services could come close to his handling of the sale. I highly recommend Greg as your broker.